You don’t think any dog can smile .. laugh? Just watch a Kerry Blue Terrier for a few minutes – he is a born clown – and he’s got the Irish sense of humour that poets write about. A sense of curiosity? Well, he has one, he wants to know what you are doing every minute – and why. The Kerry makes an ideal house pet. He is not a bundle of nerves as are some terriers. A natural hunter, a born retriever and a fine herd dog…. He has been used for these purposes in the old country. His coat never sheds hair to get all over your clothes, Rugs or furniture .. and he has no “doggy” odour. Believe it or not; it’s true. So add these items to the credit side of his ledger. The best home is one that is tolerant of a very busy dog. Kerrys are people dogs. They love to be part of a family and have a strong affinity With children. They are lively and active when the occasion demands, but are just as happy lounging in front of the fire or upside down on the settee. There are few breeders in South Africa. KUSA can help find a breeder or any of the Terrier Clubs know of breeders. Wait for that special puppy. As Kerrys are very robust for their size almost any other breed of a similar size or larger - preferably not with smaller breeds. They would prefer one who would be busy along with them. They are quite alright with cats if introduced when a puppy. As they still have instinct to herd, a bunch of ducks may be herded. Yes if age between are spaced about 2 years apart. One must be top dog. Puppy socialising is a must. Kerrys are very intelligent and quick to learn. Kerrys need to be groomed by the breeder at 8 or so weeks and by 16 weeks should be going to a grooming parlour on a regular basis. They should be groomed at a parlour no later than 4 months. A puppy is not so easily frightened by the event of going to a parlour as an older dog may be. Every owner should be in a position to bath and brush the coat on a regular basis. Kerrys are generally very healthy dogs. They have no exaggerations and if you shaved all their hair off you would see a very square and plain structure. Unlike some dogs that have legs too long or too short, heads that are squashed in or pulled out they are very basic. Their beauty lies in their coat and personality. They do occasionally have cysts in their skin, but it is not a real problem. 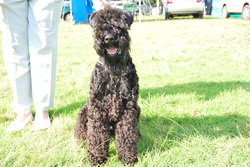 Cancer of various types affect Kerrys, just the same as any other breed. Hair in ears need taking care of and eyes too sometimes. Kerrys have a remarkable long active life. A Kerry Blue remains playful and a real companion years longer than most breeds. Those who know from experience how attached one becomes to a good dog will realise how important a characteristic this is. They have been given a bad reputation in the past of being terrible fighters. Yes they are quite formidable if provoked. The answer is early socialisation with as many different situations and other breeds as possible. It is said they are more assertive than aggressive. The other side to this wonderful breed is their love of their family and in many instances quite protective of their humans. They are never stubborn like some of the other terriers, but would rather please their humans. There are far more Do’s with this breed than Dont’s. Perhaps our flock we better double. You buy first two then three. With slumbering shapes entwining there.